Tag Archives for " John Couture "
Creating an entirely new category of business has its upsides and downsides. On one hand, you get to take advantage of your unique position in messaging and publicity. Of course, you may also find that you spend a whole lot of extra time getting people to understand your concept. The payoff, however, can be something special. My guest for this week’s episode of the Duct Tape Marketing Podcast is John Couture. Couture is the owner and founder of Bier Station in Kansas City, MO, the Midwest’s first craft beer tasting bar and bottle shop all at the same time. He and I talk about entrepreneurial lessons he has learned on his path to success. As I live in Kansas City, I’ve been able to watch the growth of this entrepreneurial success story first hand. (This may have included drinking some beer.) The thing that Bier Station has done, and it’s the thing that every business aspires to do, is to capture and nurture the imagination of a community. I know you may think, heck, they serve beer, how hard is that, but the business is a pure demonstration of what it’s like to build a culture that begins internally and shines externally in a way that draws customers. Couture clearly knows a thing or two about running a business successfully. Bier Station was listed in Draft Magazine’s Top 100 for the past three years in a row and was named Best Beer Bar in Missouri by Craftbeer.com. They weren’t the only publications giving the tasting bar and bottle shop accolades. Business Insider also named Bier Station the Best Bar in Missouri 2016. What is it like being the first in a category? How have you impacted the industry? How would you characterize your growth? 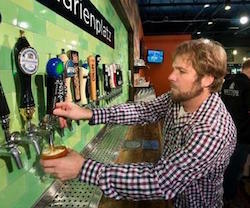 To learn more about Bier Station, click here.